Lightning Dust are yet another band billed in the End of the Road festival smaller print who have caught my ear. 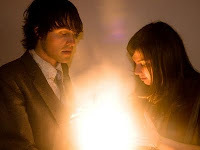 The Canadian band is a side project of Amber Webber and Joshua Wells who are both members of Black Mountain. If you're thinking rock then you'd be wrong. Lightning Dust's music has a much softer minimalistic feel with fragile sounding vocals that bring a slightly haunted/distant dimension to even their more poppier sounding songs. 'Antonia Jane' is my favourite song so far. They have released 2 albums, the first was self titled in 2007 and the second called 'Infinite Light' in 2009. I'm hoping they play in one of the more intimate stages at the festival, I'm not sure a large stage would suit their sound.